Vitamins: these are crucial for maintaining the correct bodily functions as they allow individual specific metabolic reactions and prevent diseases. 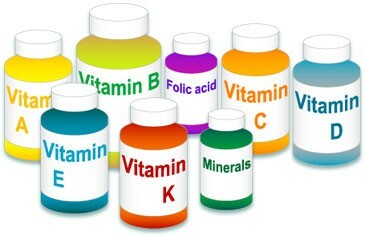 Most vitamins our body requires can't be made in our bodies so must be obtained through our diet. Vitamin D however, is synthesized by the reaction of sunlight on our skin and vitamin K can be produced by the bacteria that naturally occur in our large intestine. Vitamins facilitate processes that release energy and also support the immune system. Vitamins are usually grouped into fat soluble (A, D, E, K) or water soluble (B vitamins and C). Fat soluble vitamins can be stored in the body but water soluble ones cannot and are therefore excreted if in excess. Minerals: Macro-minerals are required in relatively large amounts e.g calcium. however trace elements are required in a much smaller amount.All minerals are essential for healthy development as they play key roles in enzyme and hormone production, immune system functioning, body structures and muscle contraction. Excessive mineral build up is prevented by absorption and excretion as needed. Some minerals compete for absorption, such as iron, zinc and copper. Optimal level refers to the process of calculating how much of a nutrient is required based on an individual level. This takes into account individual requirements and lifestyle elements. This process is complicated and requires complex biochemical analysis that is not routine practice. This figure represents an amount of nutrient that is thought to be high enough to meet the needs of the majority of people without causing risk to health. However, it is only an estimate as there may be insufficient information to estimate the distribution requirements of a population. These requirements are the most commonly used to assess daily energy requirements. These are needed in relatively large amounts on a daily basis and therefore make up the biggest proportion of dietary intake. Examples include carbohydrate, protein and fat. Carbohydrates: Carbohydrates are an invaluable source of energy for the body as they are readily available and can be accessed quickly. 1g of carbohydrate contains 4 k cal of energy. 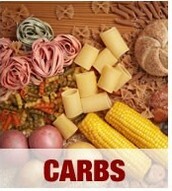 Carbohydrates can be split into two groups: simple and complex. Simple carbohydrates are formed from single or double units of different sugars that are easily digested and used to provide the body with a rapid energy source. Complex carbohydrates are important for the body as they can be broken down into glucose to provide a constant supply of energy over a long period of time. They should therefore form the largest part of our total carbohydrate intake. Other sources of complex carbohydrates, such as wholemeal bread and wholegrain rice/pasta are recommended as they contain a higher nutritional content of fibre and other micro-nutrients.Fiber is a complex carbohydrate referred to as a non-starch polysaccharide (NSFibre is a complex carbohydrate referred to as a non-starch polysaccharide (NSP). NSP mostly makes up plant cell walls and so consuming wholegrain/wholemeal plant products provides us with most of our dietary intake. NSP aids the transition of food through the digestive system and helps maintain bowel functioning. It is mainly obtained from wholegrain cereals, nuts, pulses, fruits and vegetables. Soluble fibre found in oats, rye, barley, peas, beans, lentils, fruits and vegetables helps regulate blood sugar and cholesterol levels. Insoluble fibre found in wholegrain cereals, fruits and vegetables plays an important role in preventing bowel disorders. Adults are advised to consume 18g or fibre a day.P). NSP mostly makes up plant cell walls and so consuming wholegrain/wholemeal plant products provides us with most of our dietary intake. NSP aids the transition of food through the digestive system and helps maintain bowel functioning. It is mainly obtained from wholegrain cereals, nuts, pulses, fruits and vegetables. Soluble fibre found in oats, rye, barley, peas, beans, lentils, fruits and vegetables helps regulate blood sugar and cholesterol levelss. Adults are advised to consume 18g or fibre a day. Proteins mainly help build and repair body tissue but can also be used as a secondary energy source when there is short supply of carbohydrate and fat. This may occur towards the end of a long endurance event or during a diet that severely restricts energy intake. Like carbohydrates, proteins contain 4kcal per 1g. However, excess protein cannot be stored in the body so is used to provide immediate energy or stored as fat or carbohydrate. Proteins are also divided into two groups. 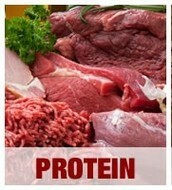 Complete proteins contain all of the essential amino acids our body cannot produce. These mainly come from animals and include eggs, meat, fish, milk, other dairy products and soya. Other proteins that are lacking in one or more essential amino acids are called incomplete proteins. These mostly come from plant sources and include cereals, rice, pasta, bread, pulses, nuts and seeds. Vegans and vegetarians must therefore carefully balance their protein intake to ensure they obtain enough essential amino acids every day. Triglycerides form the basic building blocks of fats. Each triglyceride consists of one unit of glycerol and three fatty acids. When digested, fats break down into these two components. Fats are classified as saturated or unsaturated based on their chemical structure. Fatty acids are comprised of carbon atom chains and hydrogen atoms. The number of bonds between these elements and where the bonds are located determines if the fat is saturated or unsaturated. If all the carbons are associated with two hydrogen atoms then the fat is said to be saturated. If the carbon atoms are associated with less, it is unsaturated. Unsaturated fats can be classed as monounsaturated or polyunsaturated depending on how many carbon atoms are associated with less than two hydrogen atoms. Saturated fats, such as butter and those found in meat, eggs and dairy are mostly solid at room temperature. The only exceptions are the plant sources of palm and coconut oil. However, unsaturated fats, such as sunflower oil, are mostly liquid at room temperature. The primary function of fat is to provide a densely concentrated energy source. 1g of fat = 9kcal. 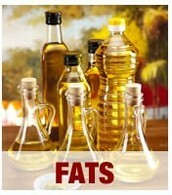 Fats also surround and protect vital organs, keep us warm and provide structural material for cells. Fats are also a source of fat soluble vitamins A,D,E and K as well as adding flavour and texture to foods.